I won't say which year! The weekend started out with dinner on Friday night at Boka. Great food, wine and conversation. I highly recommend Boka, it is more casual than I expected, which was nice. It's everyday gourmet. I woke up Saturday on the actual date of my birth, to a million text messages, phone calls, emails & facebook wall posts wishing me a happy birthday. The love was overwhelming. Around noon, my friend TT and I went to Berry Chill for a delicious frozen yogurt blast and then we drove out to the suburbs for some discount shopping. I treated myself that afternoon with Wendy's - I rarely, if ever, eat fast food. 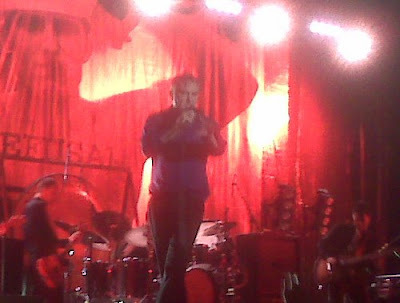 Saturday night, I went to The Aragon Ballroom to see Morrissey. It was the best! I have been a fan since I was a teenager. I remember buying my first Smith's album "Louder Than Bombs" at a record store in Rogers Park when I was 15. Saturday night, Morrissey put on an incredible show, approximately 60 to 70 minutes of very intense performance. Morrissey came out on stage wearing a tuxedo with his very young bandmates all dressed in black with the accent of a white tie. Their white ties had an image of Morrissey's face on the tie. The drummer was highlight of the show. Great lighting as well, for a small venue without many extras, lighting is very important. Today was brunch with some friends at Le Lan and tonight (I am on my way out the door) is dinner at Mado with my family. Will fill you in on the food from tonight....a little later!